Today, the day has finally come. As you can see they’ve gone through quite a process since their silvery liquid shape from the MS2D days. Not mentioning having been robots sometime in between ;) and eventually turning out as the colorful chubby blobs they are today. While my main tasks are our Character Animations, I am gladly doing some designing for our protagonists as well. So, let me give you some interesting facts about how they became what they are and why. Well, let’s start with the “Why” first. In the beginning there were robots. Then, there were the blobs. The little mercury blobs from the 2D version, which shifted themselves into the hearts of players all around the globe. As we decided to have a 3D release we started off with robots again. We simply liked them and had tons of ideas regarding which environment to put them in or what stories to tell and so on. However, we never grew as fond of our robots as we thought we would and soon after, we had to realize why: The people love the blobs! Those squishy little characters were what defined Mercury Shift after all. That is where we went back to our roots, starting over with a redesigned version of our good old mercury blobs, which were hereby named “Bismo” and “Plom”. 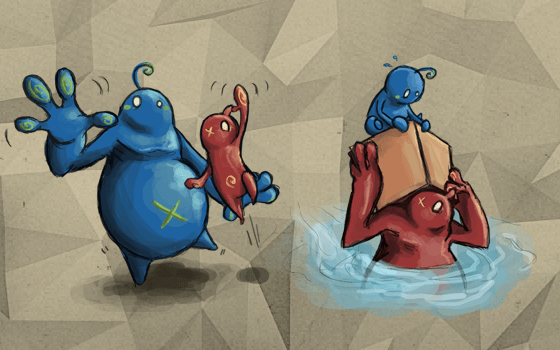 So we have our two characters: Bismo the red one and Plom the blue. Let me explain a bit about their charming points and how we came up with their funky design. 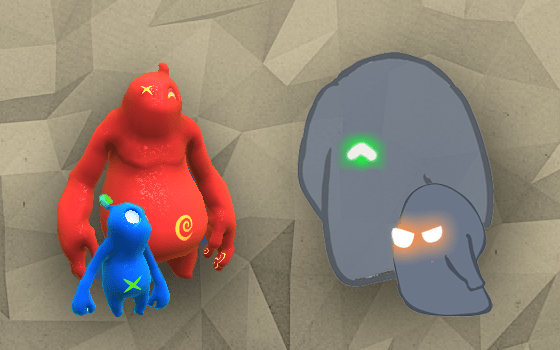 Firstly, we still wanted them to be blobs like the 2D ones, but did a few changes compared to the originals in order to have them fit into our 3D world. For instance, we gave them some more humanoid shaping and a less fluid rigidity. We tried to keep the overall simple look by using clear shapes, flat and painty colors with little patterns as highlights. Furthermore, we had them keep the principle of the number of eyes as indicator to the player count (one eye equals player one etc). We made just a minor adjustment to our player one character here: Bismo is having a scar-like cross on his face instead of no second eye at all, which makes him look a little bit more daring and therefore fits his character perfectly. All in all the design for both characters consists of soft and round shapes to create a friendly and sympathetic feeling. The two of them ought to be cute and likeable, but fun to play with and fun to tease each other here and there in the process too. Fun is really the most important here! The players should be able to enjoy our characters in any form: While working together in order to fetch a special coin for instance, or on the opposite while squishing your fellow player by “accidently” ;) dropping a crate onto his head. If the design manages to express “fun” we have achieved our goal. This entry was posted in Art department, Character and tagged character, character conception, character design. Bookmark the permalink.